These things don't really belong together but alas the joy of blogging. Although we live mere moments from Boston (eight miles by the odometer), we're also blessed with many woods nearby--Hamlin in Wayland, Paine in Weston, Lincoln Conservation Land near the DeCordova Museum, Elm Bank Reservation in South Natick, and, of course, Cold Spring Park right here in Newton, just to name a few whose paths we tred on a regular basis. Should you ever come across something like this in any of those woods, know that someone near and dear to me, one celebrating a birthday today, marks the woods in which he runs when many paths converge. On Sunday, we found that this one for five paths had survived yet another winter at Paine. Belle, at 14, still can make the trek, with a bit of huffing and puffing, so here she is too, surveying the snow, even as we were just in our shirtsleeves. And now on to Taste, which celebrated its first birthday this past week. Packed, as you can see, when we were there on Saturday, no less because there was a trio playing - percussion, voice, and keyboard. Very nice - and the cappuccino was great too. Congrats to Taste! The world is catching on to how good Taste Coffeehouse in Newtonville, Mass, is, which I've posted about a time or two before. This week's local paper, The Newton Tab, has this full-page feature, "The art of making coffee at Taste Coffeehouse," and is running this video on its blog, where you can see Nik Krankl at workl, thanks to Chrissie Long, who also wrote the feature story. "Best thing to happen to Newtonville in five years"
No secret how much I like Taste Coffee House in Newtonville - and I like to patronize the establishments of friends. When I'm not twisting people's arms to go to Shogun in West Newton, MA, which truly deserves a post of its own (it's coming, it's coming), I'm forcing them to meet me at Taste. Nik, the owner, greets me yesterday when I arrive for two back-to-back meetings. Well, commiserates with me might be a better way to put it. Or blames me. "You're responsible for this," he says, as I stand forlorn at the counter, wishing for a seat for me and my two companions. The place is packed at 10 AM (and they don't even all seem to be people working on their resumes). Then a man, sitting at a table by himself, offers me the chair across from him. I explain that there are two more coming. At which point, Nik repeats his view of me as the cause of the standing-room-only. And explains that I've blogged about Taste. At which point the man pipes up: "Here's a quote for your blog: 'Taste is the best thing to happen to Newtonville in five years.'" Asking for a name to hang that quote on, he obliges: "Les," he says. I press on. What does he do? Turns out he's Pres and CEO of The Epilepsy Foundation of Massachusetts and Rhode Island, a most worthy organization. I should have been offering him a seat. What value has come to you from blogging? What topics are off-limits; which do you avoid? Has blogging improved your writing? 4. We do pop quizzes. If you can think of any good questions, please comment. Join us. This should be fun. Remember my rave about Taste? I had to find out more. It won't be long until there's a major feature in The Times or Gourmet about these two. Or it may be in JAMA. Too good to be true but let's start with their ages - 23 - until the end of the month when first Nik Krankl turns 24 on the 24th and a week later Julia Tatum does. They're engaged. Last week, Julia began her residency in psychiatry at Brigham & Women's Hospital here in Boston (third year of Harvard Medical School). Two months ago, Nik bought Taste, the former Caffe Appassionatto, far and away the most beautiful coffee house in my hometown. So how does someone (Nik) this young (when she's not at the hospital, Julia's writing the board, washing dishes, chatting up the customers) manage such a thing - and radically improve it in a few short weeks? Study journalism, manage six JP LIcks stores for a year and a half, write for a poker magazine, and come from a food family. "I'm no stranger," Nik says, as in his mother, Gail Silverton, owns Gelato Bar in LA, his aunt is the Nancy Silverton, pastry chef, restauranteur, and cookbook author, and his father, Manfred Krankl, owns Sine Qua Non Winery in Ventura, CA. And Nik lurvvves coffee so much he "wants to roast," wants to "provide the service of roasting and how to prepare" the global bean "that wants to taste bad." Espresso is "the fragile one," he says, because it "takes coffee and puts it under a microscope." Yesterday was a tasting day at Taste and when we arrived after 5, the place was still packed as a violinist (who was blocking "our" table, ahem) played. Ah, the good old days at this location, when Sunday's meant coffee house concerts by jazz trios and guitarists. Only better. Nik's pedigree shows - I celebrated with a double decaf espresso, served with a chocolate kiss and we shared a piece of coffee cake, my indulgence. Jeff had his regular cappuccino, which he reports as "excellent." Look for us there. We're already regulars. Again. In my irregular series on great eateries, a huge hoorah for the revival of a wonderful coffee house in my beloved city of Newton, Mass. Until, say, fifteen years ago, there were delis and coffee shops of the old variety - meaning you could get a good square breakfast and maybe a cherry coke for lunch - but few sit-around-with-a-mug-of-proper-joe locales locally. 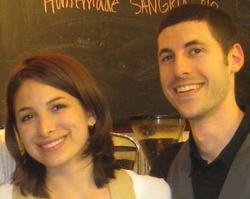 Then two enterprising and convivial entrepreneurs opened Caffe Appassianato in Newtonville, one of the city’s thirteen unique villages. Patrick and Ray had the touch and we became regular customers, taking a long moment most mornings where we cooked up more than one book. We spent so much time there that when the first article was written about the place, we were profiled as writers who hung out there. Then, the grand disappointment. Patrick and Ray opened a second location in Marblehead, Mass., and if you’ve ever been there, then you know that it’s hard to compete with the ambiance, never mind the nearby ocean, of Boston’s North Shore. When they sold the Newton shop to Omar, we were sad to lose our friends but the new owner's ebullient personality, coupled with the excellent falalel that he served, made for a welcoming atmosphere. After a couple of years, he sold to another owner who changed the name to Taste (struck me as a tad precious), the menu (that included a square pattie of hash browns), the coffee, and the atmosphere. Instead of a warm neighborhood place, it became more like a snooty coffee bar in Soho. With bad coffee. Then the unexpected. About six weeks ago, the place was sold again and the new owner has in a very short time brought back warmth, fine service, and really good coffee, in this case, beans from George Howell, founder of the long-gone but fondly remembered Coffee Connection. Welcome, Nik. 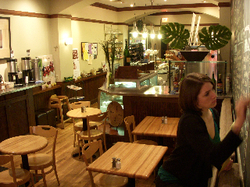 So glad to have this great place back again, now named Taste Coffee House.